28-VII-82. But 2nd class for maximum economy. So! Back at last having dumped Herring and the rest of the Norgies. WELCOME BACK. You just can’t beat Britain – and by god (or Thor if you like) Maggie has been flat to the boards trying). We may be a country of Homosexual Policeman, Burgesses in cupboards and strange men in Queens’ Bedrooms (where was the King? – conspicuous by his absence!) but we’re a good lot! Yours unexpectantly – DAM. What of the Falklands..? UP THE FJORDS! 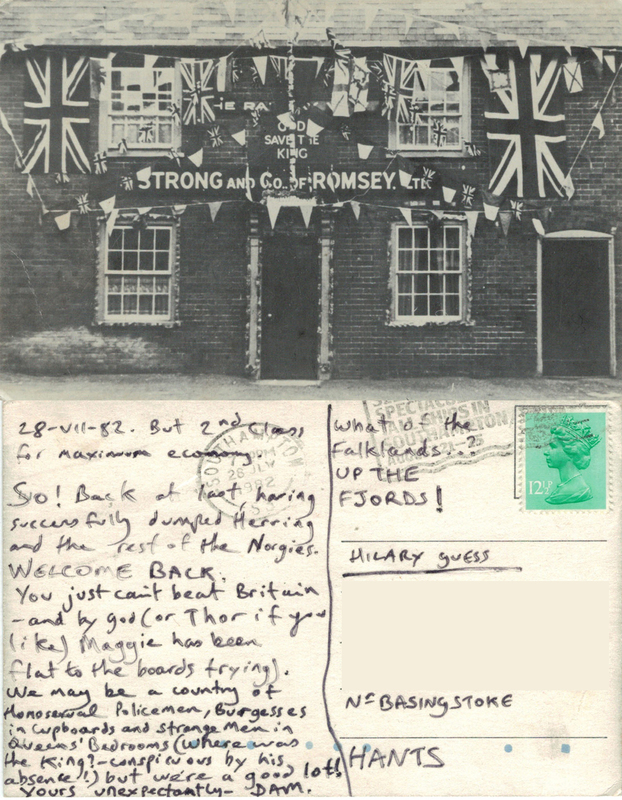 The message on the back of this postcard from July 1982 is perhaps more fascinating than the picture of The Railway Inn, Romsey, as so many references to the social history of the time are contained in such a small space. I had been working as an au pair in Norway (hence the references to herring and fjords) for a year and had been fairly cut off from UK news. In 1982 the UK was deep in recession and Margaret Thatcher’s policies of shutting down unprofitable national industries and limiting the power of the trades’ unions were very unpopular with many. However, the invasion of the Falkland Islands by Argentina allowed Maggie to demonstrate strong leadership and the UK rallied behind her, putting unemployment and inflation to one side, in favour of supporting ‘our boys’ in the South Atlantic. In 1982 being openly gay was still something of a controversy and newsworthy – LGBT rights have improved massively in the UK since then. The reference to ‘Burgesses in cupboards’ remains a mystery…maybe someone else can shed some light? We were, of course, still at the height of the Cold War. Michael Fagan somehow managed to get in to the Queen’s bedroom and engage her in conversation. The Railway Inn, Romsey is now a private house, as I believe it probably was in 1982. I guess this photo dates from VE day? DAM was at senior school with me. At some point he left and went away to private boarding school. He was a loyal letter and postcard writer, very clever and quite quirky. His name was Dean but his initials were D.A.M. which is how he always signed himself. We stayed in touch for several years and saw each other a couple of times. I think he would have liked more from our relationship, but he just didn’t do it for me; although I do recall a drunken snog on one occasion. We got briefly in touch again about 13 years ago, when the World Wide Web became available to the masses and we all reconnected through a site called ‘Friends Reunited’. We caught up on 20 years worth of news; he was working in Australia, then… then there’s always a reason why you don’t stay in touch. This entry was posted in History, News and tagged Falklands, friends, gay, history, Nostalgia, postcards, pub, pubs, Romsey, snog, snogging, spies, Thatcher. Bookmark the permalink. This is fascinating. What a character. And yes, sometimes you forget why you don’t speak anymore… until you are reminded. I’ve only just seen this comment – certainly a character, I’ve got a couple more in the same vein so watch this space!